CALGARY, ALBERTA--(Marketwired - June 16, 2015) - Altitude Resources Inc. ("ALI" or the "Company") (TSX VENTURE:ALI) is pleased to announce that it has initiated a drill permit application with the Alberta Energy Regulator for a drill program at the Palisades Coal Project located in west-central Alberta, Canada. The drill permit, which is expected to be approved in early Q3-2015, will be valid for two years. The budget of CDN $1.2 million for the program was approved in April by Altitude and its joint venture partner, JOGMEC. The drill targets in the proposed program were identified in the field assessment program started in May 2015 by Dahrouge Geological Consulting Ltd. ("Dahrouge") of Edmonton, Alberta. Dahrouge has also been contracted to oversee the proposed 2015 drill program. It is expected that the program will start shortly after the receipt of formal approval in August/September 2015. Commenting on the upcoming program Gene Wusaty, Altitude President and CEO, said, "We are very pleased with our progress with the initial phases on the JOGMEC Joint Venture. The planned 2015 drill program will test new coal targets identified in the 2015 field exploration and focus on providing more extensive coal quality analysis and increasing our resource base at Palisades." Altitude Resources is a Canadian coking coal exploration and development company focused on developing its portfolio of coking coal properties in west-central and southwestern Alberta, Canada. 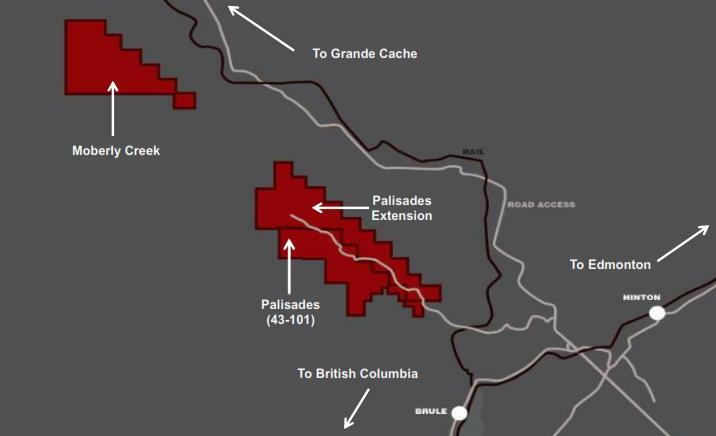 Palisades, Elan and Altitude North, properties are located near rail lines which have capacity to provide transport of coal to deep-water ports on the west coast of Canada to service the growing demand from world markets. This news release contains "forward looking information" within the meaning of applicable Canadian securities legislation. Forward looking information includes without limitation, statements regarding the size and quality of the Company's mineral resources, progress in the development of mineral properties, future capital and operating expenses, the future financial or operating performance of the Company, the prospective mineralization of the properties, planned exploration programs and the anticipated production schedule. Generally, forward looking information can be identified by the use of forward-looking terminology such as "plans", "expects" or "does not expect", "is expected", "budget", "scheduled", "estimates", "forecasts", "intends", "anticipates" or "does not anticipate", or "believes", or variations of such words and phrases or statements that certain actions, events or results "may", "could", "would", "might" or "will be taken", "occur" or "be achieved". Forward-looking information is based on assumptions that have been made by the Company as at the date of such information, including those assumptions described in the Company's technical report entitled "Resource Estimate of the Palisades Coal Property" dated November 28, 2011 which is available at www.sedar.com. Forward-looking information is subject to known and unknown risks, uncertainties and other factors that may cause the actual results, level of activity, performance or achievements of the Company to be materially different from those expressed or implied by such forward-looking information, including but not limited to: the future price of coal, industry market trends and predictions, the estimation of mineral reserves and resources, operating and exploration expenditures, costs and timing of future exploration, requirements for additional capital, government regulation of mining operations including changes in government policies, environmental risks, reclamation expenses, title disputes or claims, limitations of insurance coverage, regulatory matters, and other risks described in the public filings of the Company. Although the Company has attempted to identify important factors that could cause actual results to differ materially from those contained in forward-looking information, there may be other factors that cause results not to be as anticipated, estimated or intended. There can be no assurance that such information will prove to be accurate, as actual results and future events could differ materially from those anticipated in such information. Accordingly, readers should not place undue reliance on forward-looking information. The Company does not undertake to update any forward-looking information, except in accordance with applicable securities laws. About this company Altitude Resources Inc.